The international registy fee was twenty cents from February 1, 1945 to January 1, 1949. A registered airmail letter sent to any country with a thirty-cent airmal rate before the uniform rates of November 1, 1946 would have cost fifty cents. 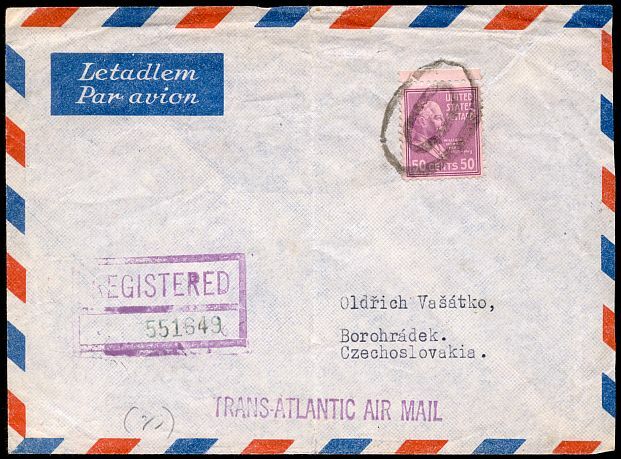 This letter was sent registered airmail from Chicago to Czechoslovakia in June of 1946. With an international registy fee of twenty-five cents from January 1, 1949 to September 1, 1952, registered airmail to any country with a twenty-five cent uniform airmal rate during that time would have cost fifty cents as well. 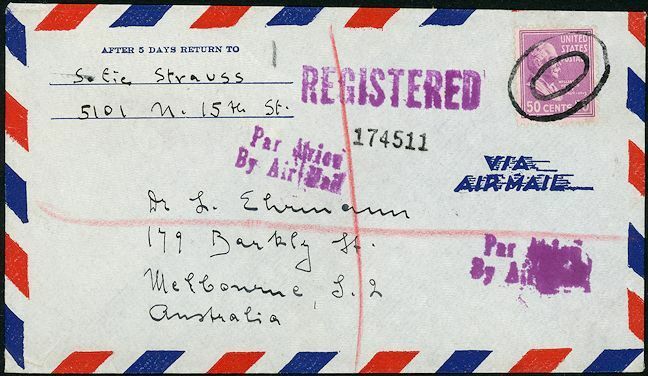 Registered airmail from Philadelphia to Australia, sent June 24, 1951.